Leading Technology Group - Think Tank - What does a cure for atherosclerosis look like? What does a cure for atherosclerosis look like? Vascular diseases, including coronary heart disease (CHD) and stroke, are the leading causes of disability and death in the developed world. The underlying driver for these diseases is atherosclerosis, a condition that involves the accumulation of lipids in the artery walls to form lesions. Globally, billions of dollars are spent on atherosclerosis research each year, but what does the ultimate cure for atherosclerosis look like? Advanced lesions are characterised by a massive accumulation of fat, thickening of the artery walls and formation of a fibrous cap (Lesion types IV–VI). Since these lesions “are nothing else but the beginning of atherosclerosis”, would it not seem reasonable to suggest that the measure of a cure for atherosclerosis would be for the arteries to be completely free of lesions of any type? When introducing his study into the early origins of atherosclerosis, Klotz, in 1911 said, “It is quite useless to argue the questions concerning the development of intimal scleroses if we study and discuss the late stages of the disease alone.” Addressing this issue, “Strong and McGill examined the aortic and coronary artery lesions in 4737 persons, aged 10 to 39 years, from 6 geographic ethnic groups that represented a wide range in severity and extent of atherosclerosis. 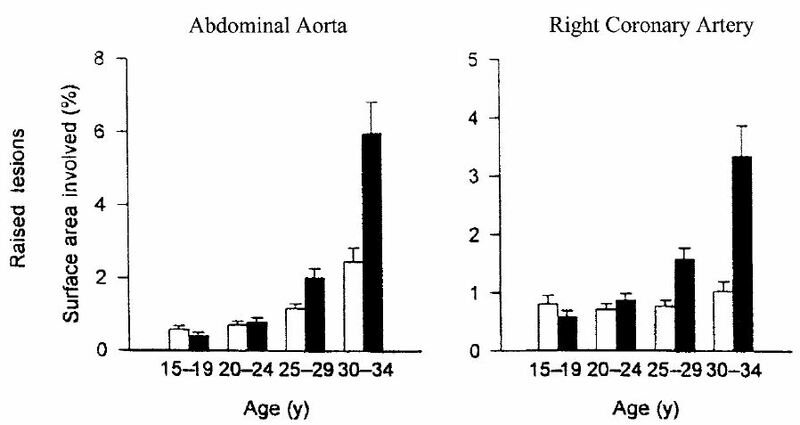 All aortas from all groups had fatty streaks.” . Further Stary found, “Among children aged 2 to 15 years, 99% have type II lesions (fatty streaks) in the aorta.”. We were stocked by the strength of the finding that almost all children and all adolescents and young adults have fatty streak in the aorta. Figure 1. Aortic atherosclerosis in New Orleans, USA. Average % surface covered by fatty streaks (early lesions) by anatomic region in 184 white cases. Taken from Holman et al., 1958. In an early review, Zeek­­ raised the question of how this dramatic rise in arterial lesions around puberty could be interpreted. Although Holman and colleagues were not able to give a definitive answer to this question, they suggested that there might be a relationship between the development of lesions and hormonal activity at this age. Their data did not support the concept of diet as the principal factor in atherogenesis at this early age. More recent work, the Pathobiological Determinants of Atherosclerosis in Youth (PDAY) study,[5,6] has demonstrated that, due to genetics, obesity and other risk factors, the ratios of bad to good cholesterol in youth have been associated with increased lesion size and advancement. However, only 10% of PDAY subjects under the age of 40 had unfavourable cholesterol profiles. Even in this subset, no substantial differential advancement of the lesions was shown beyond that seen in those subjects with the best cholesterol profiles, until after the age of 25 (Figure 2). This suggests that unfavourable cholesterol ratios, while being critical as we age, are not a primary driver of lesion growth and progression in childhood and early adult life. A study by Zinserling in 1924, which included children who had died during the post-war famine in Germany, supports this finding: children who were severely emaciated as a result of starvation showed no difference in the incidence or extent of fatty streaks compared to those who were well nourished. Figure 2: Surface area of raised lesions for those with the worst (black) and best (white) ratios of bad to good cholesterol. Taken from Zieske et al., 2002. Returning to the initial question: what does a cure for atherosclerosis look like? We believe that the ultimate goal of medicine is to maintain the body in peak health, where peak health is defined as the state reached at physical maturity. Yet this research shows that the majority of young adults (18–25 years) will have major arterial lesions, largely independent of their risk profile. In the face of this conflict, we propose that a cure for atherosclerosis would be: arteries containing early lesions at the levels seen in early adult life, but free of advanced lesions. Strong, a successor to Holman, agrees and this position appears to be the status quo in medical research today. However, he acknowledges that fatty streaks in early adult life are “clinically harmless and potentially reversible”. A cure for atherosclerosis involving the complete removal of all lesions with no side effects might be possible. However, given that young adults in peak health have early lesions covering more than 20% of the area of their abdominal aortas, it seems unreasonable to rule out the possibility of metabolic side effects or disruption of vascular homeostasis as a result of complete removal of these lesions. 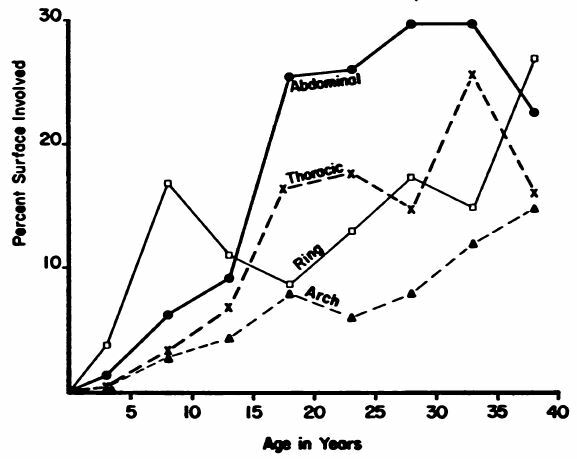 All pubescent children have arterial lesions and, given the surprising consistency of their growth and coverage independent of risk factors, perhaps there is even a possibility that these early fatty streaks might serve some yet unknown productive purpose, and that it is only aging that leads to their involvement in atherosclerosis. We are not aware of any direct evidence for this contrarian hypothesis and we certainly agree that lesions in the coronary arteries are highly indicative of disease. Accumulation of lipids in these critical and small coronary arteries is dangerous, however research has demonstrated that while over half of pubescent children have early coronary lesions, these – unlike aortic lesions – are extremely small, covering 3% or less of the surface. In conclusion, we believe that atherosclerosis may be deemed to be ‘cured’ even when early lesions at the levels seen at physical maturity are present. I am sure that Holman and others would have been happy to accept a cure that was capable of maintaining lesions in the early stage. Of course, a medical approach that can stall the progression of lesions and remediate the damage seen in advanced lesions is not an easier problem; in fact it may be more difficult to achieve than their complete removal. Working towards this type of cure may reduce the focus on research aiming to remove lesions, and increase research on the maintenance of the vascular environment influencing lesions. If nothing else, we believe that considering the questions that were raised but not definitively answered over a century ago, could lead to new insights. We would be interested in supporting further research on the origins of atherosclerosis in early life and believe that existing work could be applied to answering some of the questions raised here. Stary, H. C. (1990). The sequence of cell and matrix changes in atherosclerotic lesions of coronary arteries in the first forty years of life. European Heart Journal, 11(Suppl E), 3–19. Strong, J. P., & McGill Jr, H. C. (1969). The pediatric aspects of atherosclerosis. Journal of Atherosclerosis Research, 9(3), 251–265. Klotz, O., & Manning, M. F. (1911). Fatty streaks in the intima of arteries. Journal of Pathology and Bacteriology, 16(1), 211–220. Holman, R. L., McGill Jr, H. C., Strong, J. P., & Geer, J. C. (1958). The Natural History of Atherosclerosis: The Early aortic lesions as seen in New Orleans in the middle of the 20th century*. American Journal of Pathology, 34(2), 209. Zieske, A. W., Malcom, G. T., & Strong, J. P. (2002). Natural history and risk factors of atherosclerosis in children and youth: the PDAY study. Fetal & Pediatric Pathology, 21(2), 213­–237. Zeek, P. (1930). Juvenile arteriosclerosis. Archives of Pathology, 10(10), 417–446. Zinserling, W. D. (1925). Untersuchungen über Atherosklerose. Virchows Archiv, 255(3), 677–705. Strong, J. P., Malcom, G. T., McMahan, C. A., Tracy, R. E., Newman III, W. P., Herderick, E. E., … & Pathobiological Determinants of Atherosclerosis in Youth Research Group. (1999). Prevalence and extent of atherosclerosis in adolescents and young adults: implications for prevention from the Pathobiological Determinants of Atherosclerosis in Youth Study. Jama, 281(8), 727-735. Stary, H. C., Chandler, A. B., Glagov, S., Guyton, J. R., Insull, W., Rosenfeld, M. E., … & Wissler, R. W. (1994). A definition of initial, fatty streak, and intermediate lesions of atherosclerosis. A report from the Committee on Vascular Lesions of the Council on Arteriosclerosis, American Heart Association. Arteriosclerosis, Thrombosis, and Vascular Biology, 14(5), 840-856.